Nearly three weeks after Hurricane Maria made landfall in Puerto Rico, the island is still very much in crisis mode. 85% of PR is still without power, more than 40% is still without potable water, and roughly one in four grocery stores are still closed. The official death toll has remained at 36, but the actual number is expected to be much higher, with uncounted bodies being found in places that still have no way to communicate. Gov. Ricardo Rosselló is lobbying Capitol Hill for more than $4 billion from various agencies and loan program to "meet the immediate emergency needs of Puerto Rico," according to a letter obtained by CNN. Rosselló said the island is on the brink of "a massive liquidity crisis." Boots on the ground: More than 19,000 federal civilian personnel and military service members, including more than 1,395 FEMA personnel, are on the ground in PR and the U.S. Virgin Islands. 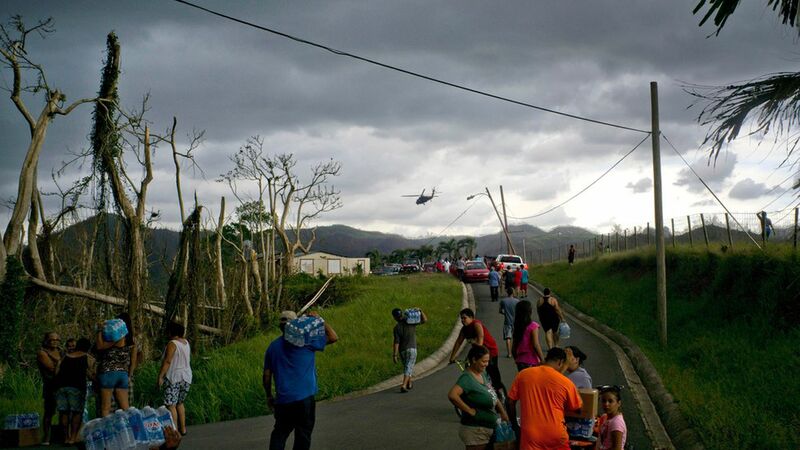 State help: 22 U.S. states are supporting 69 requests for mutual aid in PR. 14 states are supporting 37 requests for mutual aid in the U.S. Virgin Islands. Electricity: 15% of the island has power, and roughly 28% of cell towers have been restored. Food: Approximately 77% of grocery stores are open, up from 65% Friday. Gas: Roughly 78% of retail gas stations are operational. Transportation: Only 392 miles of Puerto Rico's 5,073 miles of roads are open. All airports and federally maintained ports are open or open with restrictions. Water and waste: Approximately 56.8% of Puerto Rico Aqueduct and Sewer Authority (PRASA) customers have potable water, and additional water is being provided by bottled and bulk water. 60% of waste water treatment plants are working on generator power. Medical care: All hospitals (67) are open and operating, but only 25 are working with electricity. The others remain on backup power systems, and most are without air conditioning. 96% of Dialysis Centers are open, but several are still running on generators. Supplies centers: As of October 6, Rosello had established 10 regional staging areas around the island, serving all 78 municipalities. The National Guard is delivering supplies to those centers. Go deeper: Puerto Ricans are leaving, some possibly forever (The Daily Beast); U.S. mail carriers heroes in PR (Reuters); Hedge funds lose on PR (NYT Dealbook).